You mean you’re not on holiday yet? Diffusion in liquids: When substances dissolve in liquids (like salt dissolving in water) the substances spread out. We call this spreading out of dissolved particles diffusion. The end result of this is that the solute particles that have dissolved in water will spread out evenly. This movement or spreading out is due to the fact that in liquids the particles are moving randomly. Diffusion in gases: When two or more different gases, like oxygen and nitrogen are mixed they will mix themselves evenly. We call this mixing of particles diffusion. This is due to the random movement of particles. Diffusion in solids: Diffusion does not happen in solids because the particles are not free to move around and so they cannot inter-mix. Diffusion in jelly: Jelly is a liquid before it has set and looks like a solid when it has set. However the truth is a little more interesting. After it has set jelly is not really a solid or a liquid, it is in fact a mixture of both of them. 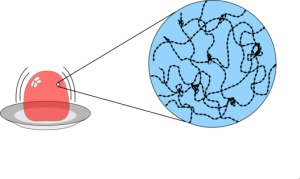 As shown in the diagram below there are long fibres of protein or carbohydrate which form the solid part of the jelly and between these fibres there are spaces where water molecules are free to move around. This is why substances can diffuse through jelly. Using Jelly in science experiments… Because it allows diffusion through it, jelly is very useful as it allows us to track the movement substances through the jelly for example in Bioassay experiments testing the effectiveness of antibiotics as shown in the photograph below. 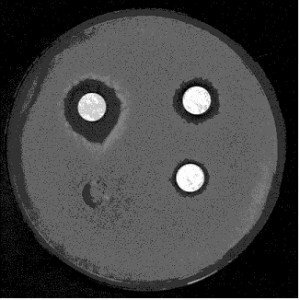 In this photo it is easy to see which antibiotic is the best at killing bacteria (the biggest clear area). The antibiotic has diffused through the jelly. Hydrochloric acid of the following concentrations: 1.0M, 0.8M, 0.6M, 0.4M 0.2M. 1) Pour equal volumes of the hot Agar/Indicator mix into a different petri dish, leave to cool and set overnight. 2) Use the cork borer to cut 5 wells into the jelly making sure all the jelly is removed from the well. 3) Use a pipette to carefully fill the first well with 1.0 M Hydrochloric acid and start stop-clock. 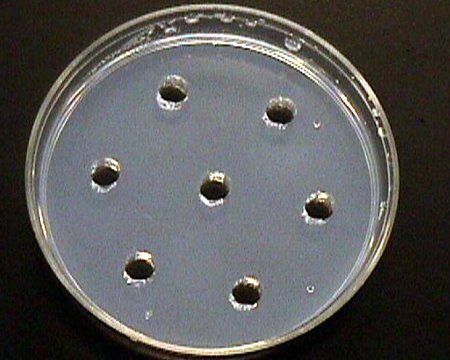 4) As the acid diffuses through the agar the indicator will turn red. After 5 minutes use the ruler to measure how far the red colour has moved.